If you think summer’s end will preclude you from enjoying the pleasures of a picnic until next year, think again! 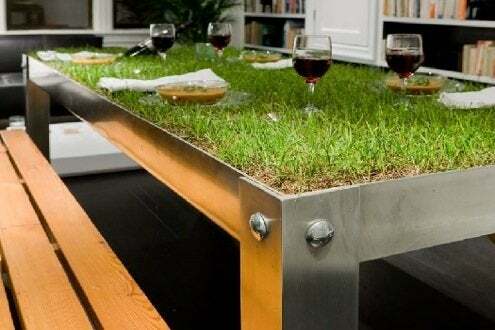 This PicNYC table from the design firm of Haiko Cornelissen really delivers on the promise of bringing the outdoors in. 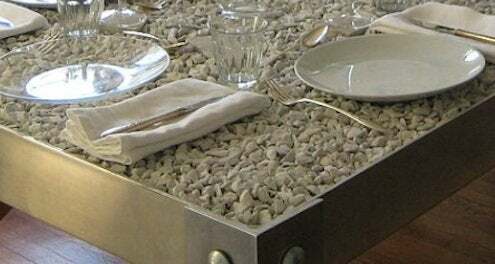 The table top—made from premium lightweight aluminum that is cut, folded, bolted and welded together by an American manufacturer—is deep enough to act as a planter, accommodating soil and grass, even a stone foundation for drainage. While you don’t have to worry about spilling wine, soup, or gravy, you will need to make certain your table is getting the necessary sunlight and water to keep it fresh and green. According to the architect, “no table mower exists yet,” but an occasional trim by hand should be all that’s needed to keep your 36″ x 84″ plot of land happy in its city digs. If you get tired of the lawn care, you can always opt for something more manageable, like a bed of stones. For more information, visit the architects’ site here.